“MooBoo Bubble Tea” has been hitting the headlines lately but not as a great product name. Instead there are the controversial issues regarding alleged unpaid hours issues (thankfully now resolved legally.) I wonder whether this burst the bubble of MooBoo as the logo looks like a tea stain thrown at a wall – I sincerely hope not. More likely the great British tradition is to sit around a table and a cup of tea always puts the world to rights! Jokes aside: this chain of teashops is gathering momentum across the UK for its variety of Cha’s proving the residents of the UK are still great tea lovers who are now daringly trying other brands than merely Earl Grey or Ceylon tea. So where did this name come from? BooHoo is a sound of sobbing. Surely none of the above! Bubble tea (aka known as boba or pearls) was first developed in 1980 in Taiwan with some obscure reference to a Chinese slang term for large breasts, as it enunciates phonetically to the English word for bubbles . Yet, they are simply tapioca balls added to the drink of tea as a mixture of beverage and dessert. 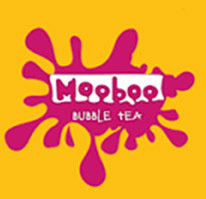 So it is curious how the name was coined into MooBoo and only gained significance by adding the manacle “Bubble Tea” as a descriptor or for .com availability along with trademark approval.